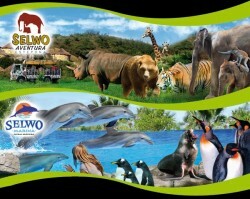 This Friday the 24th of February is the start of the new 2012 season in Selwo Adventure, in Estepona, and Selwo Marina Dolphinarium, in Benalmadena, the leisure centre parks on the Costa del Sol. 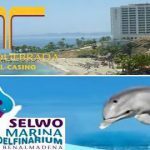 This year is very special for the Selwo Marina Dolphinarium as it celebrates its tenth anniversary and due to this, it’s preparing several proposals to celebrate such a special birthday during the the whole season. On the hand, Selwo Adventure will also be offering a few outstanding innovations that will bring the visitor closer to real African territories. Selwo Adventure, the park of nature, adventure and fauna, has incorporated new and exclusive species this season such as the hippos whose natural habitat the Masai Mara Brook has been specially prepared to be able to adopt Margarita and Manolo, a breeding pair of this great African mammal. The hyenas territory is another new attraction situated in the portico of nature, where as from now, we will be able to get a closer look and get to know this carnivorous mammal that has a very important roll in the African ecosystem. And more novelties like The Territory of the Lions, situated in the central village of Selwo Adventure, that allows you to stand only a few metres away from the king of the African fauna. Near the lions, in the Reserve of the lakes, we’ll see the sitatungas, another African originated specie that has been incorporated to the park this season. Over 200 species of animals such as leopards, elephants, giraffes, zebras, rhinos, dromedaries, ostriches, fruit bats, etc…are waiting for you at Selwo Adventure to enjoy an unforgettable day. An adventure to complete with various activities such as Ziwa, the Tyrolean traverse of the great lake of Africa, the dromedary rides, the route of the hanging bridges or archery, all surrounded by nature. Selwo Adventure also has other proposals like Selwo Lodge for example, that allow the visitors to extend their stay. This hotel is a replica of a typical African village with comfortable rooms. And, for the younger visitors, there are also Nature Classrooms and Summer Camps.